Stare long enough at all 201 episodes of The Office and certain patterns begin to emerge. For instance: The show stares staring back. A byproduct of their exhaustive charting of human history and culture (as told by the employees of the Dunder Mifflin Paper Company), Office Time Machine creators Joe Sabia and Aaron Rasmussen have introduced The Office Stare Machine, an emotional panopticon that allows a single user to observe every feeling ever expressed by Michael Scott and company—provided that those feelings were expressed silently and directly into the lens of a camera. It’s a map of the human heart, mind, and soul that could someday teach visiting extraterrestrials how the office drones of the early 21st century showed happiness, fear, sadness, and even obscure emotional states like “woolly” (the last of which, apparently, has significant overlap with “perplexed.”) One question that’s not cleared up by the site’s thorough FAQ: If The Office Stare Machine transmits these sentiments, does it mean The Office Stare Machine is also feeling these sentiments? And if so, what’s its opinion of having to mix in silent takes from the two Steve Carell-less seasons with those from the previous, clearly superior seasons? 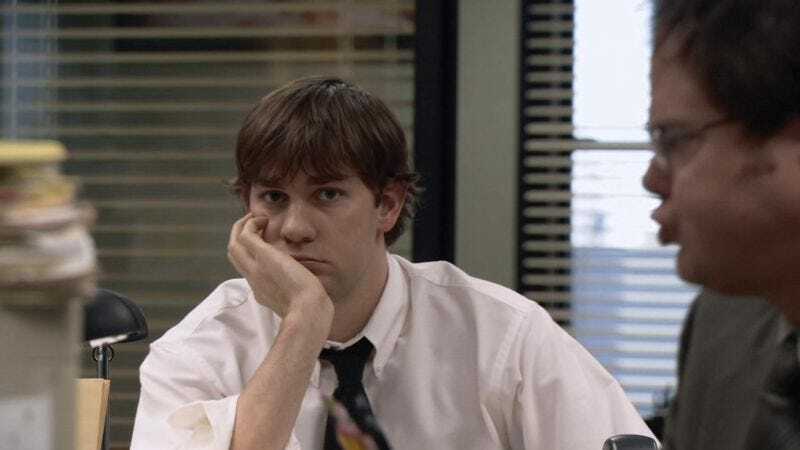 Furthermore: How can there be a series of clips for “disgruntled” when Michael specifically told Jan that everyone in the office is extremely gruntled?